Even though Goa is the smallest state on the Western coast of India, it is one of the most popular due to its rich heritage, warm and friendly people, tropical climate, scenic beaches and exotic handicraft. Back in the 60’s & 70’s, the North of the island became a hippy-haven, a place to escape everyday life and quickly became somewhere for backpackers to hang out and party. For people travelling India alone, it was the perfect introduction. Naturally, the more popular a place becomes, the more it changes and over time The North now seems to be associated with high-rise hotels, watersports, street markets and cultural buildings but it also still retains its party-vibe. Goa was recommended to us by someone when we were holidaying in Morocco, so we carried out some research on which was the best resort to stay – North or South? We tapped Goa onto the end of a week touring the Golden Triangle and were looking for something quieter, relaxing and less developed – with all this in mind, we were advised to head South and chose Cavelossim Beach at the Dona Sylvia Beach Resort. To ensure the area doesn’t become monopolised with high-rise hotels in the North, the resorts around Cavelossim are not allowed to be more than two storeys high. The grounds are in a beautifully tranquil setting, filled with trees and pretty flowers, including my favourite – frangipani! The sand at Cavelossim beach was white, soft and crunchy – it felt a little like snow underfoot (only warmer!). On our first day we relished in feeling the warm refreshing Arabian sea lap against our toes. We watched crabs dart across the beach and watched locals trying to sell their wares. They attempted to coax us into their beach shacks but after all the haggling in Rajasthan we simply wanted to relax and walk – shopping would come later. Whilst we were in Goa, we celebrated our 2nd wedding anniversary so we headed to the beach for sunset with a bottle of champagne. The sky turned from pastel peach to oranges then pink – it was the perfect end to our special day. The Goan’s are renowned for their fine multi-cultural cuisine and we both absolutely loved the culinary masterpieces served up at the resort every single time we dined. They whip up everything possible with various types of veg and we piled this high onto our plates – this is unusual for us, we love our meat!! Outside the resort was a small road with shops and a few bars. We always had fun talking and joking with the locals, they really made us feel part of the community and quickly recognised our faces. One night we stopped for a beer and cocktail at the Jazz Inn which, bizarrely, had a big frangipani tree growing through the middle of it! We grooved to the cool tunes played by the DJ who was also a Bob Marley impersonator from Birmingham, England. We had a great chat with him and discovered he spends 6 months a year in Goa. On one occasion we caught an auto-rickshaw as a taster of true India, it was hilarious! We laughed the entire journey! The night sky was pitch black and our vehicle barely lit the way with its tiny headlamps – goodness knows how he could see! It was loud, crazy and filthy dirty, my hair looked like a scarecrow when we finished! The driver was so proud at how quickly we had reached our destination! We had to shower when we were back to our hotel as we felt so disgusting – but the journey was well worth it! Dudhsager Falls (pronounced dud-sager) means “sea of milk” and is located in Colem, two bumpy hours on a coach from where we were staying. To reach the falls, we were transferred into an overland jeep for the final 45 minutes of the journey and we drove through 3 lakes (very cool!) followed by a 10 minute walk over stones and boulders. We stripped off to our bathers and gingerly inched our bodies into the freezing cold fresh water – obviously after a few minutes of swimming and we were acclimatised, it was OK but it was rather crisp for those first initial moments! Big fish swam alongside us and people threw pieces of banana for them to eat – oh yes – fish …eating bananas! We swam over to the cascading falls and felt its power as the spray hit our face, it was beautiful. We had some free time here, so we chilled on a rock listening to the roar of the tumbling water – music to our ears! Considered to be one of the best beaches in Goa, Palolem was an hour’s taxi drive from our resort. It is an idyllic white crescent beach naturally blessed with palm trees lining the shore, calm turquoise sea and colourful beach huts. It definitely had a laid back vibe and we watched as fishermen gathered their nets on the beach – all very picture-postcard. We had travelled here to enjoy the beach, and whilst sitting down for an hour, a few sellers asked if we wanted to buy anything, and when we declined they left us alone. This made it such a pleasure to relax and we understood the lure of why a backpacker would spend weeks here – purely to enjoy the simple, chilled life! After taking a peaceful stroll along the shore, we sat in a beach bar sipping a cold drink and just looking at the view, we wanted take time to soak up the ambience and really “feel” what this place was all about. So to sum up Palolem – it really is a tranquil slice of paradise! As the sun set on our last evening, we sat on the beach and reminisced at how magical our time had been. Even though the sun had disappeared, there was such a nice atmosphere we chose to stay a few hours. We listened to the music playing, danced on the sand and watched the high tide lap against the beach tables. People lit paper lanterns and set them adrift into the sky. We watched as they faded into the distance forming an orange dot on the skyline, noticeably different to the gleaming white of the stars. It was the best way to end our magical trip. A tourist visa is required for most nationalities but there is an e-visa scheme to apply online. The International Airport is in Dabolim on the west coast roughly in the middle of the state. Seasons: November – March – dry and cooler (by Indian standards). April & May it is unbearably hot and June – Sept/October have the monsoon rains. We were attracted to Goa purely because someone recommended it! We had already looked at the Golden Circle tour with tiger safari, so Goa was the natural place to add-on. Incidentally, whilst staying here, tour operators do give the option for overnights trips to visit the Taj Mahal and for tiger safaris. If you’re hanging out in Goa, head further south and check out the cool state of Kerala. Backwaters, surf and tonnes of cool things to do! My name is Angie Briggs and I am half of a travel blog called “Feet Do Travel”, my husband Simon is the other foot. I have been travelling for 20 years and always kept journals of my adventures.When I met Sy, thankfully he shared my passion for travel and we have continued to see the world together whilst working full time!We are currently in the secret process of selling all our belongings to become permanent nomadic travellers!A dream come true! A very interesting post as I also familiar very little about Goa, but now I have added this to my list of places to visit. I really love this place while reading your article I got excited and remembering my Goa trip Thanks for sharing Keep posting. Would love this for our family! It looks a wonderful place to visit there. What a Great post! Goa likes an amazing place where I can enjoy a lot. I am adding these places on my list where I want to Goa. thanks for sharing the best information. The photos are also great. Nice post. it is a very useful post. I like very much. Thank you for your sharing. Wow this is nice blog sites. Very interesting blogs. I reallly like your traveling images. Thanks for sharing.Really a wonderful post. Thanks for posting such an informative & useful post with us. keep posting & inspire us like this post.Amazing pictures and very interesting article….. Thanks a lot for giving proper tourist knowledge and share the different type of culture related to different places. If you are planning for your holiday and searching for the beautiful place to spend your time then you can wander around this vibrant city. Nice pictures & very helpful information to Goa. Thanks to sharing this blog…..!!! Thank you so much. Glad you liked the article. Thanks for your comment. This is quite helpful. And that picture of the waterfall is amazing 🙂 Keep sharing more. Great. I like your article and I have never been there so I am planning to visit there very soon on my upcoming vacation. Thanks for sharing the information. Very well explained the unknown things about goa. I’m going this month on Feb’18 28th. join there. Thanks for reading Arun. Angie wrote a great article for us. We can not wait to go. We hope you have a great time and happy travels. Nice description about our own Goa. But you should come back for New year’s eve party to enjoy the real goa. Inspiring blog, will be visiting in this November. It would be fun if someone likes to join us. Thank you so much Julian. Not too sure about the Wifi as Angie wrote this awesome guide for us. We do have a few friends who live there and are bloggers. They have never complained about it but then again they most likely have their own connection. I am so sorry we could be more help. Have a great trip. I’ve met a few travellers who only have good things to say about Goa, but I’ve never been myself. I know it used to bit a hippy spot but that’s about as far as my knowledge goes, oh and it was featured one of the 2nd Bourne film at the start. Angie has given an excellent account and detailed write-up. Hi Barry, that was our knowledge also (hippy place). Until we met someone who lived there and told us more about Goa. We have never been either and would like to one day. Angie has definitely made us want to go. Hope you get there soon mate. Happy travels. Angie is such a great writer! What ever she writes down, it always consumes me in a good way. After reading her stories of various places in the world, I feel like I need to go to every single one of them right now! Ha! Same goes with this one and Goa. Can’t wait! I have been reading a lot about Goa lately. Looks like a great place to explore. Love those beautiful falls! Stunning photos and gave me a very good insight into a part of India I would really love to visit when I eventually make it out there. I have heard of some of the places you mention but you’ve really brought them alive with your photos! Thanks for sharing! What a great post! Goa looks like an amazing place to spend some time. I’ll be adding this to my very, very long list of great places to go. Thanks so much for sharing – will pin this for later too! Thanks so much Jenn. Angie wrote a great guide for us. We can’t wait to visit this area of India too. Goa has been near the top of our list for a long time and we are thinking of making it our summer destination this year. We have heard that the monsoons make everything greener! It looks absolutely stunning – especially Dudhsager Falls. One of my favourite things in the world is swimming in a waterfall plunge pool and listening to the water beat down. It does, doesn’t it. We can not wait to visit India and Goa is on our list. Waterfall swim is so magical. Thanks for your comment Karianne. 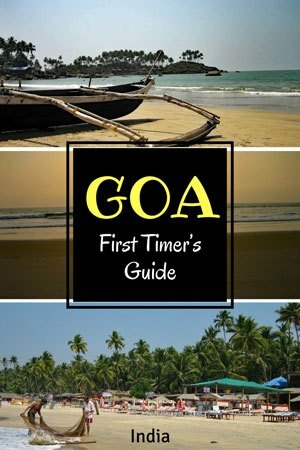 A very informative post as I too know very little about Goa, but now I have added this to my list of places to visit. The photos are great ! As someone who knows very little about India and Goa, this was great. Palolem looks really relaxing and I like that the beach vendors aren’t too pushy. Surprisingly, I had heard of the Dudhsager Falls before somehow and they’re definitely somewhere I’d like to visit. Beautiful photos Angie!